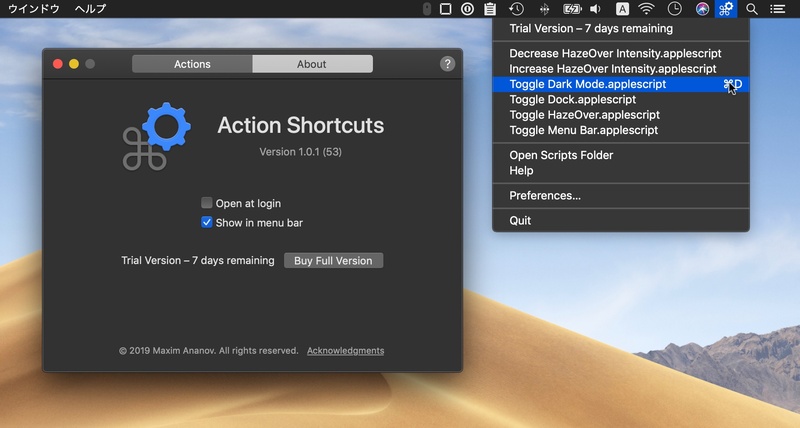 メニューバーやショートカットキーからAppleScriptを実行できるMac用ユーティリティアプリ「Action Shortcuts for Scripts」がリリース。 | AAPL Ch. I’ve made a new app to make this easier with keyboard shortcuts or the menu bar. It’s called ActionShortcuts – try it out! P.S. Apple recently introduced an official way of offering free trials. I plan to use this approach in my apps for new customers. Even if you’re not interested in automation, please try out ActionShortcuts and let me know how starting the trial goes for you.